But I’m keeping it healthy this time, since the last one was a bit artery clogging. 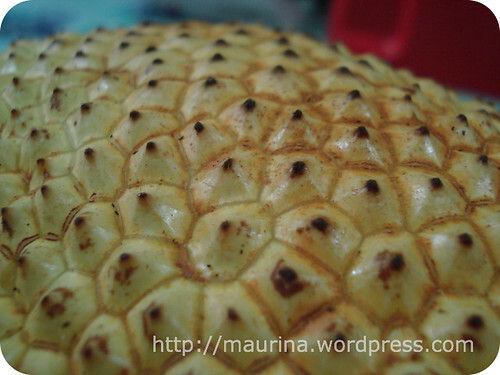 This particular post will be featuring a delicious fruit from the depths of the Bruneian jungles of Tutong. 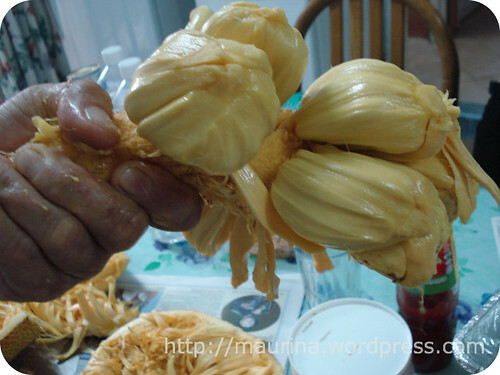 Dad says it is called the “tebadak nangka”, also known as “tebadak kawin”. 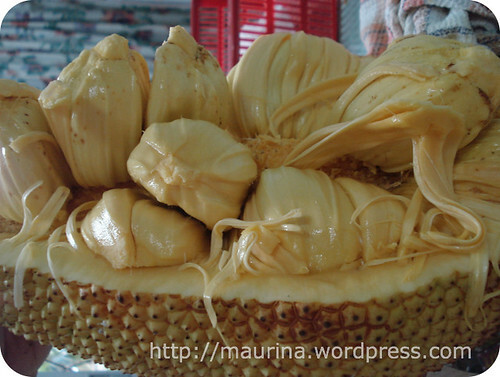 To date, I have no English name for it except maybe jackfruit tebadak which sounds weird. Haha. 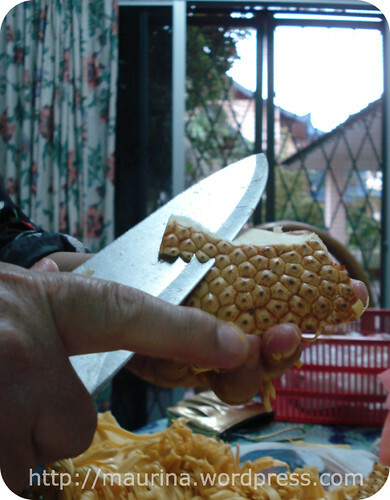 The outer shell is somewhat hard, but not as hard as the “king”, the durian. 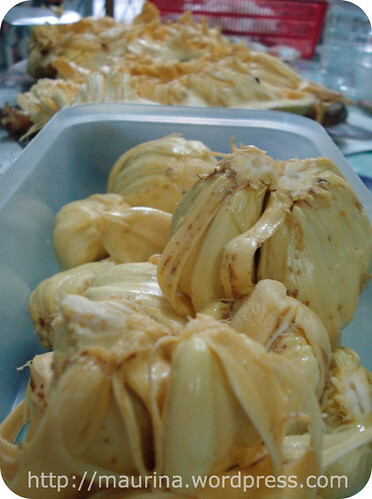 Tebadak however, win out over durian on size. It can reach the size of a 6 month old baby, weighing about 10 kilograms. It is more approachable as the exterior is not made up of spikes, but rather, bubbles of eye like bumps. It is the flesh inside that makes this particular tebadak different from the regular tebadak. 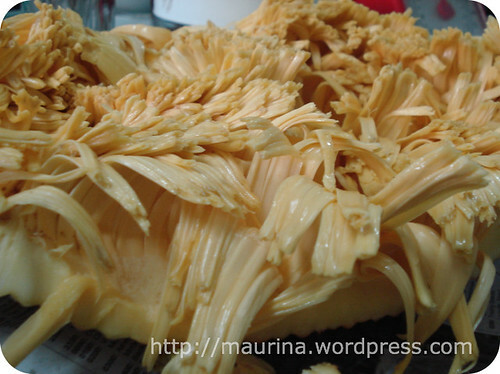 The flesh almost resembles the shape and texture of a jackfruit, caused by a simple “marriage” method. 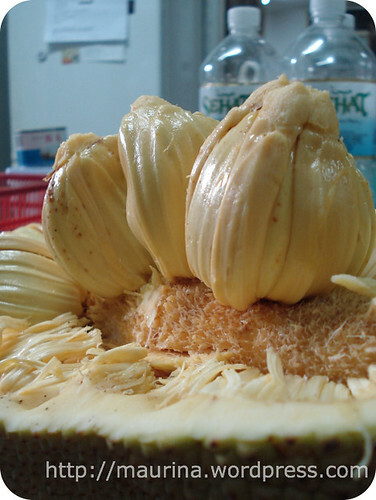 The regular tebadak’s individual fruits inside is also rarely as big as the tebadak nangka. The flesh is sweet, with a lingering smell that always reminds me of Tutong and its fruit-rich forests. Some pieces of to the fruit have brown spots blemishing what would otherwise be flawless pale yellow meat, but it’s a good sign. They are signs of natural caramelisation, from sugars present in the fruit. The fruit is basically attached on to the stem. So the best way to extract the fruit speedily is by extracting the stem away from the fruit. Those are dad’s hands holding on to the stem while I take pictures. Between the fruit and the outer shell, is the kelanyat. Also edible, and as sweet as the flesh, this part of the fruit is usually cooked in coconut milk and eaten with rice as a savoury dish. Of course you need to remove the funny “eyes” first before cooking. The individual fruits have a seed inside of it which is as big as a small ping pong ball. This can be boiled in salted water, and will turn out as soft as a potato. That can then be eaten with some dessicated coconut, or sweetened evaporated milk. And the leftovers, can be kept in a container in the fridge. It will keep for at least two weeks. 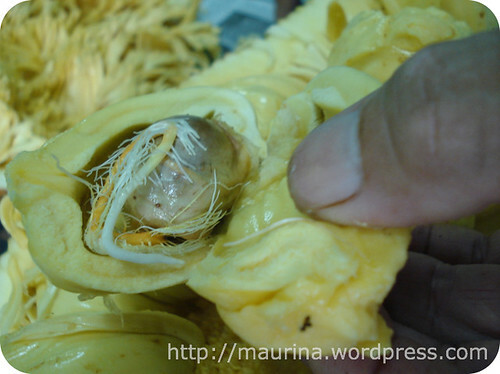 The one that taste a bit like jackfruit is tibadak kawin, the “original” non-married tibadak will not be as crunchy (like jackfruit) and has a more chewy consistency and is smaller. Meng… enough food! Give us the happenings! Inspiring people, hobbies, groupies, music! But…. nothing is happening! It will come. buat kan cucur nyaman tu. hehehe.